The Middle: "Valentine's Day II"
Welcome back to the A.V. Club's newly continuing coverage of The Middle! We got enough pageviews and comments last time around that we're adding it provisionally. Which has turned out nicely this week, at least, because I liked this episode much more than the last. Both episodes focused on a slice of Americana that I try to keep at arm's length—the Super Bowl last time, Valentine's Day this time—but the key difference is that this time around, some of the characters on the show share my ambivalence. The Super Bowl was roundly celebrated, but tonight's episode begins with Mike ranting about how Valentine's Day is a conspiracy by the greeting card companies. He's willing to go along with it, of course, because he doesn't want to be the only husband in America who doesn't give his wife flowers. Those kinds of romantic compromises across relationships form the core of the show, something Frankie makes clear at the end when she says “You have to hide who you really are until you've reeled 'em in.” That's the kind of honest cynicism I can get behind, and it's also the kind of thing that a sitcom might be the best form for depicting. A film is too short, and those compromises end up looking tragic more than comic. In the hands of skilled comic actors, with dozens of episodes of character growth, the love and comfort that go into a successful long-term relationship can manifest. There wasn't much of that last episode, largely because the main characters were separated from one another. This time, they interact more regularly, except for Sue, who's on her own (which turns into a joke of its own by the end). Each of the characters is at their own stage in a romantic relationship, and each one is compromising in order to do it. Sue is looking for the boy she met at Halloween. Brick is trying to impress a girl in his class. Axl has a new girlfriend. And of course, Frankie and Mike have their decades of marriage. Happily, each of those storylines also has some great comedy to go along with it. Sue's dedication to finding her kiss boy veers towards the psychotic, something her friend tells her, prompting the response “You really think I could have made him up? I'm not that creative!” When he does show up, she tries to show him around and remind him, but doesn't quite succeed at it until she utterly embarrasses herself. It's probably the weakest storyline of the show, but Sue's enthusiasm salvages both the situation and the plot. Meanwhile, Mike gets pushed to go to Brick's class to chaperone their Valentine's Day celebrations. Brick has a too-detailed, too-nerdy master plan for getting the girl to like him, which Mike blows by telling the girl's mom. In his attempts to salvage the situation, Mike doesn't just make it worse by pushing the girl into the arms of another, he also triggers a near-riot amongst the gathered 9-year olds. It's pretty standard sitcom stuff, but it's standard because it works, and it works really well when he stops the riot by declaring that the kids shouldn't even be celebrating V-Day, because the Chinese are out there studying math, “so they can sell us Americans a heart-shaped load of CRAP!” He gets banned from the classroom as well. Axl has a new girlfriend and needs his mom's help in buying her a Valentine's Day present, which makes Frankie deliriously happy, so much so that she overlooks his continuing escalation of the problems with his new girlfriend, from tattoos to piercings to dyed hair to shoplifting to riding a motorcycle. It's even more standard sitcom fare, but it slowly escalates into Frankie compromising her mothering instincts in order to continue dating her somewhat estranged son. The thing that makes the episode work, though, is when the plotlines and the parents intersect, as their advice reveals more about them than it does helping their kids. When Mike tries to describe the mom he met at the school, he mentions her eye color, and Frankie covers her eyes and demands to know what color her eyes are. He misses. Sure, it's predictable and kind of dumb, but it's also really funny. Even better, when they try to tell Brick about how they met, Frankie reveals that she lied about liking Reservoir Dogs in order to keep Mike, since he was cute. This offends him, and totally derails any conversation they have for the rest of the episode: Her liking it was the only reason he asked her out again! Through their interactions, The Middle manages to maintain both a strong comic core and a decent emotional connection. This is what was missing from the first episode I watched, and it's also why I'm much happier about reviewing this show again. “Candy AND words? Who invented these? 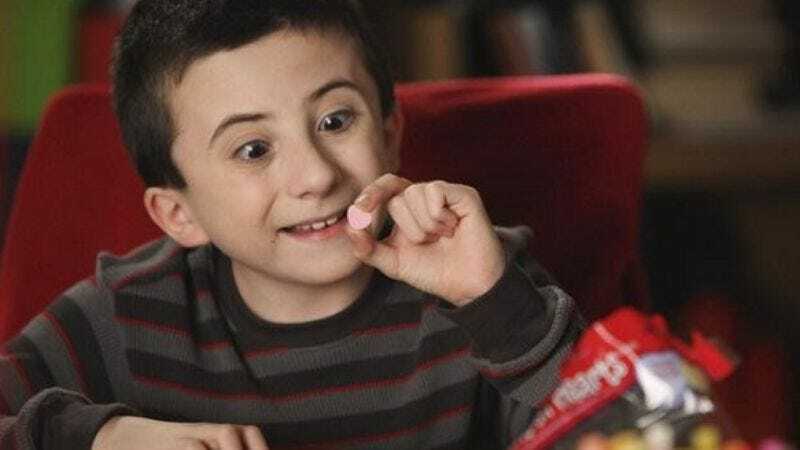 ?” Brick is excited about the discovery of Valentine's Day candy hearts. “Would the cops listen? No.” Axl defends his new girlfriend.